The Cutting Garden is one of Plymouth’s most popular, experienced and stylish ladies’ and gentlemen’s hair salons. Design Inspiration has supplied web design services to The Cutting Garden for many years. When the salon came under new ownership in 2015, they approached us to conduct a complete re-brand and create a new website. .
We created a striking new logo, accompanied by website with blog. Design Inspiration then provided social media advice, WordPress and social media training. We have subsequently provided content creation services and ongoing support. We gave The Cutting Garden a modern website with information on pricing, profiles of all the stylists, a compelling blog, and integrated their online booking system. We also included a client comments page so that new clients can see how pleased existing clients are with The Cutting Garden. 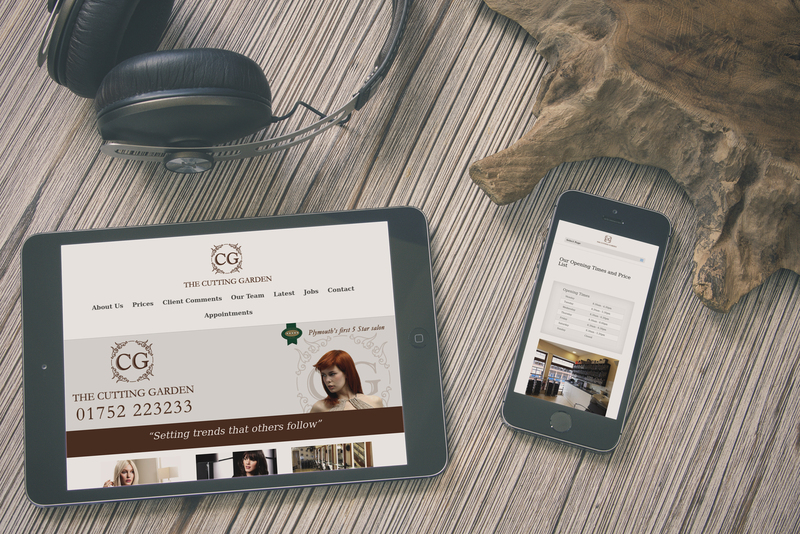 Overall, our solution was to design a stylish site which incorporated all of these features and which was easy for them to keep up to date, thereby keeping The Cutting Garden salon at the cutting edge..